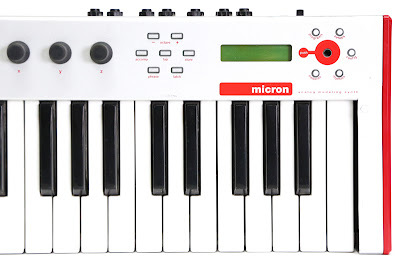 "The Micron is an eight-voice analog-modeling synthesizer. Despite its small size, you'll be impressed with the micron's big sound. 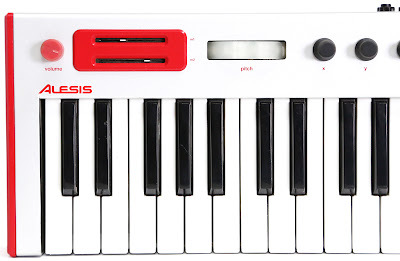 Whether you use a synth to accompany you on stage or in the studio, and whether you prefer to work with the hundreds of preset Alesis sounds or create your own, the micron is the perfect companion. The micron also contains a powerful sequencing section with phrase, step, and drum sequencing, an arpeggiator, and stereo effects. 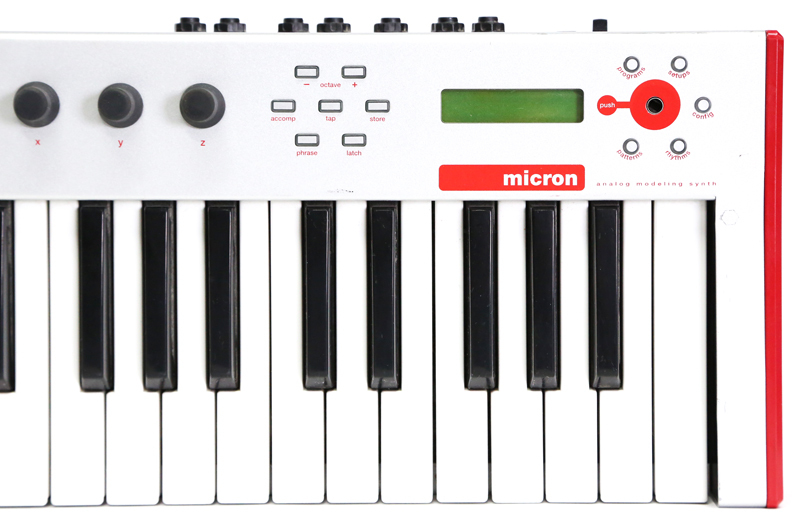 The micron has two multi-mode filters, three envelope generators, and two LFOs: the full spectrum of synthesis components for shaping and creating sonorities and textures. 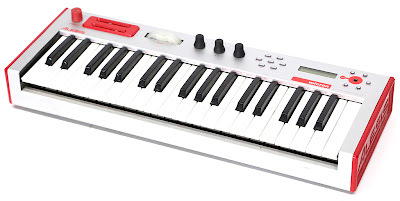 For stage and studio-ready quality, the micron has 24-bit audio outputs and inputs via balanced connections. Each of the micron’s voices contains two filters, and each filter can be one of the following different types, each with its own character and sonic flavor: Bypass, Low Pass: ob 2-pole, tb 3-pole, mg 4-pole, rp 4-pole, jp 4-pole, al 8-pole; Band Pass: ob 2-pole, al 6-pole, octave dual, band limit; High Pass: ob 2-pole, op 4-pole; three Vocal Formants, four Comb Filters, Phase Warp, Frequency, Resonance, Key Tracking, Envelope Amount, Offset, and Absolute. Each of the micron’s voices contains two LFOs, each of which offers rate, depth, shape, and tempo sync; and three envelopes: Amp Envelope, Filter Envelope, and Pitch/Modulation Envelope. Aside from missing one knob, this example is in very nice cosmetic condition and perfect working order. The original 9v power adapter is NOT included."